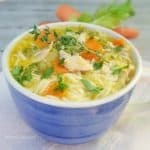 Chicken Noodle Soup is a very tasty, loaded with vegetables, healthy Chicken Soup which is ideal for the colder evenings. Since I can remember my two favorite soups were and still are, Chicken Noodle Soup and Creamy Tomato Soup, not necessarily in that order. 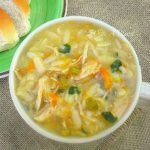 Delicious, thick, filling and warming low-fat Quick Chicken Orzo Soup is the best comfort food in a flash ! Loaded with vegetables too ! 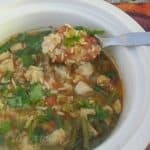 Instead of using the usual thin noodles, I used Orzo in this quick Chicken and Orzo Soup. And the soup turned out delicious and much more comforting than noodles.